Arborist Info Ashburn: When Should You Call A Professional? You probably don’t call a professional gardener when you notice a dandelion in your flower bed. Nor do you phone a landscaping company just because your shrubs need pruning. So you might be wondering why everyone makes such a big deal about calling an arborist for tree maintenance. The truth is that arborists are a certain type of tree care professional that have taken the time (and classes!) to learn as much information about tree maintenance as possible. This means that they’re uniquely positioned to help you with tree maintenance tasks that are outside the normal realm of yard work. 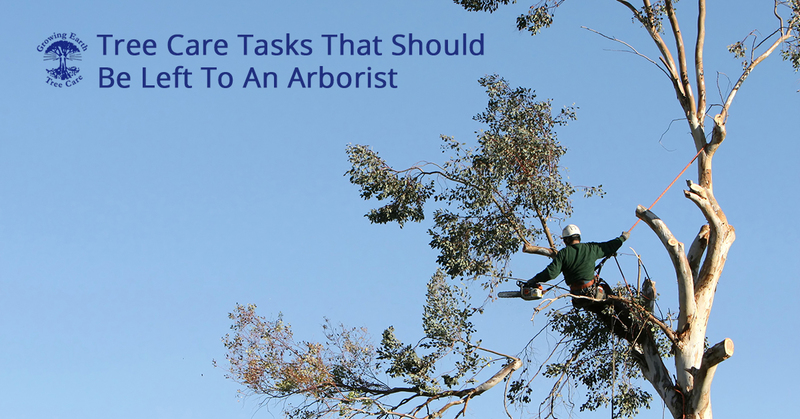 Keep reading to learn more about what makes the arborists at Growing Earth Tree Care the best in the business, as well as the certain tree care tasks that should always be left up to the professionals. Just like you’d never trust your vehicle maintenance to anyone but a certified mechanic, we believe that the best way to ensure your trees live long healthy lives is to trust their maintenance to a certified arborist. So exactly what services should you reserve for the skilled hands of the certified arborists at Growing Earth Tree Care? Large Tree Pruning – Armed with the proper information, it’s perfectly fine to attend to the pruning of smaller trees on your own. However, once you find yourself needing a ladder to reach the lowest branches of the tree, it’s time to call an arborist. New Tree Planting – Unlike planting tomatoes in your garden or tulip bulbs in your flower beds, planting a tree is both a big investment and a big change for your overall landscaping. Young trees can be very vulnerable, so it’s important to utilize the services of an arborist who has expert info on environmental factors and other threats that may kill it before it even gets started. Tree Removal – It should go without saying that if tree pruning isn’t safe for a DIY job, tree removal is completely off limits! Felling a tree is dangerous work and it takes a lot of experience to know how to make it fall in such a way that it doesn’t damage your property or other plant life. Emergency Tree Maintenance – Anytime you have a tree emergency, such as broken limbs following and ice storm of the sudden appearance of a fungal disease, it’s important to call a certified arborist right away. This tree care professional will be able to assess the overall health of the tree, recommending both short- and long-term solutions. Don’t Trust Your Trees To Anyone But A Certified Arborist! Contact the professionals at Growing Earth Tree Care today for a free service quote.